This is the part three of a three-part series taking an in-depth look at the youth climate movement and the stories the mainstream media missed at Power Shift 2009. For the introduction and links to the rest of the series, head here or see links at end of this post. If you’ve made it this far in this series, you’ve already read a couple thousand words about the “youth climate movement.” I’ve been using that term throughout this series, but after spending even a little time amongst this movement, it’s clear that “youth climate movement” is something of a misnomer, adopted for lack of a better word. You see, this movement is growing into something much more expansive than those words capture. What began partly as an environmental movement, brought together to prevent the ecological disaster of climate change, has morphed into a far-reaching movement tackling issues as far ranging as equity, justice, and economic reform. “All for green! Green for all!” has become one of the movement’s rally cries, a simple turn of phrase that has deep meaning for many pulled into this movement. Juan Reynosa, a 27-year old community organizer with New Mexico Youth Organized, testified before Congress and shared his vision of a clean, green economy strong enough to lift up the currently marginalized and disaffected. “We must ensure that clean energy economy brings jobs to current dirty energy sacrifice zones. If not, we will have failed,” added Smith. This isn’t a movement about saving polar bears or ice caps, these young activists make sure to tell you. Or more accurately, it’s a movement about that, but about so much more. This youth movement is setting out to dissolve the inequities and injustices of the current energy system, to empower and lift up communities, and to build the kind of economy they ultimately want to work and live in. 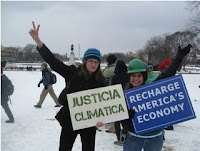 If Power Shift 2009 proves that the “youth climate movement” is growing up, then the real work is unquestionably still ahead. The oil, gas, and coal industries are well aware of the PR and political fight for survival now on their hands and are spending tens of millions each year to flood the airwaves and internet with advertising and crowd the halls of Congress with their lobbyists. 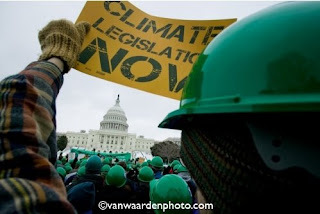 Besides well-entrenched corporate interests, the path to victory on climate legislation also runs smack dab through a U.S. Congress that is divided on the issue along both partisan and geographic lines. In June 2008, the Senate briefly considered the Lieberman-Warner Climate Security Act. Despite the fact that the bill was considered woefully inadequate by many in the movement, the Climate Security Act still fell far short of the sixty votes needed to advance in the Senate. The good news is that those who attended Power Shift seem aware of these challenges and eager to embrace them. At Power Shift 2009, each attendee received a credential badge that read “Leader.” Not participant. Not attendee. Leader. And that’s exactly what each of the 12,000 “Power Shifters” walking the halls of the D.C. Convention Center was: a young leader that has since returned to their university campus or home community to keep the pressure on – equipped now with new tools, new connections and allies, and a new energy to keep organizing until the power shift is complete. “Each one of these leaders will return home and recruit ten of their friends to join us in the next month, and each of them will recruit ten more in the next month,” promised Energy Action Coalition’s Jessy Tolkan. Plans for sustained political engagement are already underway. When representatives and senators return to their districts for the mid-April congressional recess, young leaders will greet them ready to continue the conversation about clean energy solutions begun this weekend at Power Shift. Focus the Nation, an Oregon-based group with national aims, is helping students organize town hall meetings across the country during the April recess, creating forums to continue the discussion between elected officials and the young people who will be most affected by the political decisions made today. The Energy Action Coalition and partner 1Sky are also working to identify leaders, both young and old, in every voting precinct in the country, enabling widespread and effective grassroots organizing all across the nation. Student activists also plan to join with affected communities and environmental NGOs to keep the fight against the impacts of coal’s mining and use active in the coming months. Protests targeting coal plants in Illinois and North Carolina and mountain top removal coal mining in West Virginia are planned for March and April (indeed, action is heating up at Coal River Mountain, slated for destruction soon). The advocacy group, Appalachian Voices, is bringing coalfield residents to Washington D.C. to lobby for the passage of the Clean Water Protection Act and an end to mountaintop removal this month as well. And on April 1st, Energy Action Coalition will join the international Rising Tide network to organize annual “Fossil Fools Day” actions nationwide.